China’s leadership signaled that further stimulus measures are being planned, as disappointing economic data showed that the current piecemeal approach isn’t working. The nation’s economic situation is changing, downward pressure is increasing, and the government needs to take timely steps to counter this, according to a statement from a Politburo meeting Wednesday chaired by President Xi Jinping. China will push for larger tax cuts, Premier Li Keqiang said on Tuesday, adding that it would help small firms facing funding difficulties and widen access for private firms in infrastructure. China will not resort to competitive currency devaluation and is able to keep its yuan currency basically stable, Li added, reiterating that it would not resort to forceful stimulus to prop up the economy. To bang on the drum again, I've never argued China will devalue for competitive reasons or because of a trade war. I do think a trade war could squeeze the dollar supply and create increased pressure on the yuan, but I have and still expect currency depreciation because of past inflation. For the same reason I expect U.S. dollars will be much cheaper (eventually). Markets eventually balance. A nation that drives up asset prices with inflation reaches a fork in the road where it must choose currency destruction or crippling (in the short term) asset price deflation. I have seen no indication China will opt for a 30 percent decline in home prices nationwide. Li Keqiang pointed out that we have discussed in depth the Chinese economy and reform and opening up. China's economy and the world economy are deeply integrated. At present, we are experiencing certain downward pressures while operating smoothly. However, we have many policy tools and control measures to overcome difficulties. We have a huge market and abundant human resources, which can keep the economy long-term. We will maintain the continuity of economic policies, will not engage in "big floods", will not rely solely on investment and exports, but will continue to implement a proactive fiscal policy and a prudent monetary policy to strengthen directional regulation and camera regulation . Vigorously promote simple administration, reduce taxes, reduce fees, and take more effective measures to resolve the problem of financing difficulties and financing for private enterprises and small and micro enterprises . We will relax market access for the private economy, increase the opening up of the service industry and the financial industry, and create a fair business environment for state-owned enterprises, private enterprises, and foreign companies, and further promote the market activity and social creativity. Late in 2008, in the middle of the global financial crisis, China decided to unleash a 4 trillion yuan ($586 billion) wave of stimulus, mainly through infrastructure investment. 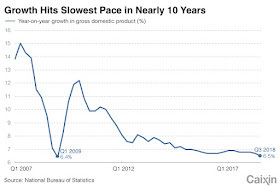 After plummeting in 2008, China’s economic growth rate only slipped slightly in 2009 and accelerated in 2010 (see chart below). But this rush of extra liquidity, largely provided via bank loans, left stagnant puddles in its wake as corporate debts swelled and financial risks proliferated. Ten years later, the current crackdown on excessive leverage, overcapacity and shadow banking is still in part trying to deal with its lingering after-effects. China’s leadership, fond of agricultural metaphors, have called such massive stimulus “flood irrigation” (大水漫灌 dà shuǐ màn guàn), an ancient and inefficient method of irrigating crops by simply releasing water over the ground’s surface. Water can pool where it is not needed, and much is just lost via evaporation. China’s latest quarterly growth figures, for July to September 2018, were the weakest since the first quarter of 2009. Although officials continue to stress that their tactics are different now, the suspicion remains that the government might just release the floodwaters again. After all, it worked last time. Let's look at the chart: it worked one time. Now they have to flood the economy to keep the growth rate from collapsing. To restart growth they need to actually deleverage. Allowing asset deflation and debt defaults is the best way, the more politically palatable way is to deleverage via inflation. Let this chart sink in. They have flooded the economy with credit over the past 10 years and only when they did a government stimulus equivalent of 13 percent of GDP (on top of private market credit growth) in 2009 did it produce a rise in growth. Since then they've seen total credit growth north of 20 percent in some years and it keeps the economy from slowing more. China has turned Japanese. The difference is Japan "turned Japanese" during the 1990s and 2000s when a booming technology sector, followed by U.S. housing bubble and China growth, powered the world economy. 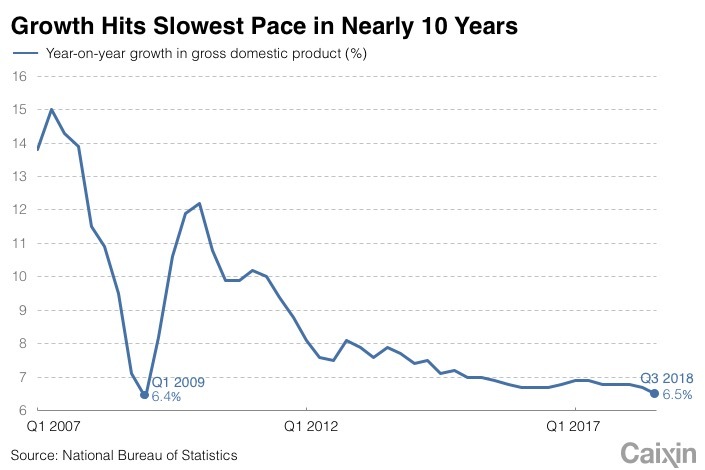 China can't float by on global growth because it is the marginal producer of global economic growth.